I started listening to Christmas music this past week. Ready or not, Christmas will be here before we know it! To help stay on top of it all, I make lists. P.S. Don’t forget to read the bonus list! Every person who is getting a gift goes on my list. I write out a few ideas of gifts to give them and a price I’d like to stay around. Then when the gift is purchased, I write it down along with how much was spent. My husband and I have a couple of favorite treats that I like to keep around the house during December. Most years, I also like to make a treat or two for family and neighbors. I keep it simple and usually stick to 3 things: fudge, toffee, and frosted sugar cookies. There are endless activities this time of year. To keep it simple, I write all the events on the calendar and keep invitations paper-clipped to the calendar. There are always extra grocery items needed for holiday dinners and making special Christmas treats. If I write out my candy and baking list early, then I can be on the look out and get those items on sale in November and early December. We are not hosting anyone in our home, but we will be visiting family. I have already started making mental notes of things that we need to take along with us, but a couple weeks before we leave, I will write out a detailed list. It is so easy to forget things when I don’t write out a list. There are some things that aren’t necessary and create more stress than it is worth. I make sure that I am realistic about what I can get done and don’t worry about the “extras.” Come back next week to find out what I am NOT doing this Christmas! 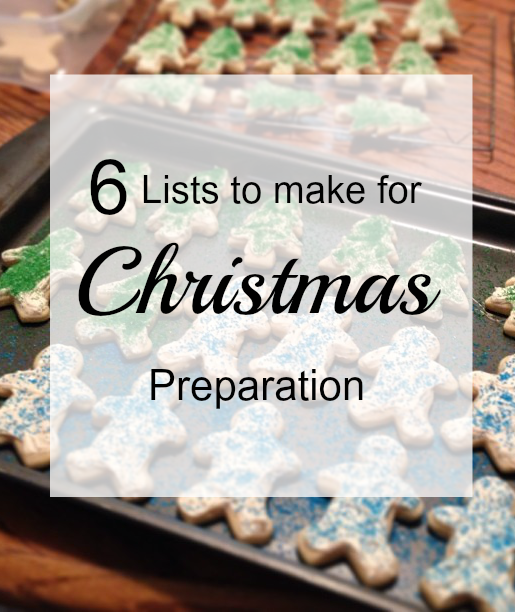 What other lists will you make for Christmas preparation? I love the idea of a "not-doing list." It has made the holidays much more enjoyable!! Loved this! Especially the not-doing list 🙂 I think it's even more important than the must-do one for sure. You are also reminding me I need to take pictures for our Christmas cards, thank you for that! Having a not-doing list has helped me stress a lot less! I hope your pictures go well. I'm planning on taking pictures for our Christmas cards too! Hello from Tuesday Talk. I will be taking notes here to help motivate me this holiday season. Great tips to encourage others. I like how you do your gift list. Thanks for linking with us today. Hi, Michelle! Thank you for stopping by from Tuesday Talk. I'm glad this was an encouragement. The gift list really helps me focus when I am shopping for everyone's presents. Great list! I can't wait for Christmas and there so much Christmas spirit in this post! Thank you! I am so ready for the Christmas season as well!